This post has been updated. Please see the foot for a statement from PayPal. It does not appear, at this time, that the breach goes any deeper than Twitter, but that remains to be seen. The PayPal UK site appears to be unaffected, though having such a public-facing account appearing compromised is a blow to customer confidence. There is, of course, some misinformation being spread via tweets. One such message is stating that all PayPal accounts will be frozen while the account is cleaned up again. It’s far from the first bit of problems that PayPal has had. Most recently, the company came under fire for suspending accounts that were aiding the cause of WikiLeaks and a few months ago the company caught flak for harassing event organizers in the US. We’ll keep an eye on things as they unfold. For now, until you see an official announcement linked on Twitter from PayPal, it’s safe to say that you shouldn’t believe anything you read from the account. 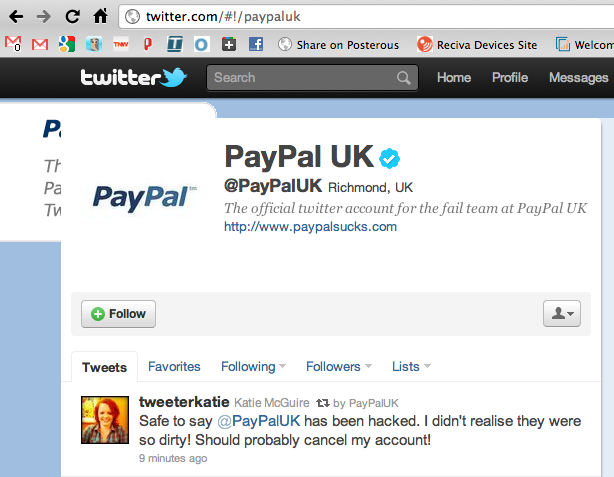 PayPal UK’s Twitter feed was targeted by hackers tonight. PayPal would like to reassure all customers that PayPal’s UK customer systems and data have not been breached or hacked in any way. There is no link between customer systems and our Twitter account.